Moving vans outside Government House, the governor's residence, as the O'Malleys leave. 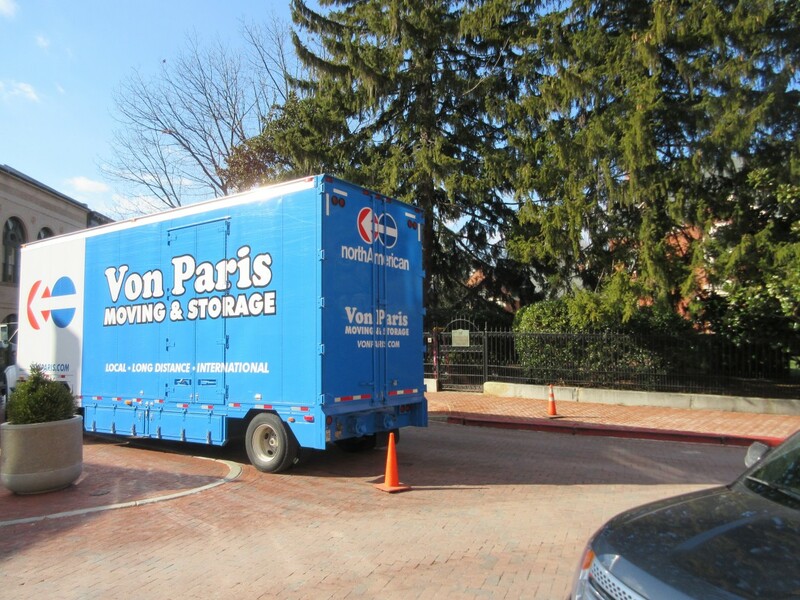 Photo above: Moving vans were parked all last week in front of Government House, the governor’s residence, moving out the O’Malley family. The Changing of the Guard takes place in Annapolis this week: There will be a sharp course correction with the arrival of Hogan’s Heroes. On Wednesday, Republican Larry Hogan Jr. takes the oath of office as governor, followed by the departure of former Democratic Gov. Martin O’Malley as he starts his quixotic quest for the highest office in the land. On Thursday, Gov. Hogan unveils his sharply reduced budget, which will be a shock to the system of Maryland Democrats. Thus, the Hogan era begins. Democratic interest groups will have to learn some new tricks. The old way of bludgeoning a Democratic governor and Democratic legislature into submission won’t work. Massing hundreds, or thousands, of protesters on the State House steps used to do the trick when O’Malley was in power. Hogan, though, could care less if the teachers union or the state workers union or the construction unions fill Lawyers’ Mall to overflowing or flood his office with form-letter emails. Simply demanding more pay, more benefits, more school funds, and more social services won’t be helpful, either. The new governor is approaching his job with a firm set of ideas on how to govern Maryland that is in marked contrast to the traditional Democratic method. No longer will the state budget balloon in order to satisfy special interest groups within the Democratic Party. No longer will special-interest bills designed to mollify those same power bases within the Democratic Party hold sway on the second floor of the State House. Hogan takes a businessman’s approach to governing. He holds definite conservative views, but Larry Hogan is far from an extremist. He’s no friend of tea party fanatics. He’s not about to take Maryland back to the Stone Age. That could be seen clearly in many of his appointments. Hogan chose a well-rounded group of upper-level managers and advisers, including a good number of pragmatic, moderate Democrats with legislative experience, such as former Sen. Rona Kramer from Montgomery County, former Baltimore County Councilman Joe Bartenfelder, former Dels. Steve DeBoy and Keiffer Mitchell from the Baltimore area and former Dels. Van Mitchell and George Owings from Southern Maryland. DeBoy in particular is an important choice, since he will be engaged in lobbying lawmakers on behalf of the Hogan administration. He’s a retired cop from Catonsville who was highly respected by fellow delegates for his friendliness, common-sense and conservative pragmatism. Many of the appointees have strong business backgrounds. That is the key to understanding Hogan’s mindset. People with experience in business know the crucial importance of avoiding a deficit. You spend what you take in, and no more. You don’t expand services hoping that the economy soars. That is the path to bankruptcy. Hogan won’t have much sympathy for teacher unions demanding ever-increasing amounts of school funding. That’s not how businesses work. Hogan is going to take a jaundiced view of state worker union demands for pay increases and benefit gains every year. He knows that’s a sure way to drive a business to the brink of insolvency. There’s going to be plenty of pain as Hogan squeezes budgetary excesses out of Maryland’s funding programs. Businesses do that all the time. The goal is to build a leaner yet more effective company. Hogan is almost certain to tell Marylanders that state government has gotten itself into bad habits: excessive borrowing; depleting all the government’s “piggy bank” accounts to paper over revenue shortages; shifting around funds; spending far more each year on education than revenues allow, imposing new taxes to cover up bureaucratic inefficiencies. Righting the Ship of State in Maryland won’t be easy. The last Republican governor, Bob Ehrlich, rashly thought his charisma would be enough to win over doubting Democrats in the legislature. Hogan was part of Ehrlich’s team. He witnessed the gridlock and ill will that resulted. He learned some painful lessons. The new governor is a glad-handing, commercial land-development salesman and negotiator. Those skills will come in handy. He knows that the art of the deal involves compromise – on both sides. Governing from the center is pivotal if Hogan is to succeed. He can’t be a conservative ideologue, tea party libertarian or doctrinaire Republican. None of that will fly with a liberal General Assembly. Hogan already has shown us he knows how to campaign as a Republican centrist. It proved wildly popular with voters in November. If he can repeat that recipe as governor, Larry Hogan Jr. could be living in the governor’s mansion for a considerable length of time. Barry Rascovar’s political blog can be found at www.politicalmaryland.com.